For over two years now, I have been dealing with the same back pain, side pain, all around right side of the body pain. Some days are better than others, it is always there, my right side never feels one hundred percent. I don't know what it is going to be like when I wake up, the pain can vary in degrees from moment to moment. I am not myself anymore. I stray away from having people over or hanging out because I don't know if I will feel alright, and the idea of having to have my house ready for people to come over is exhausting. I don't think I am the best mom I can be to my kids. I am irritable all the time due to (1) the pain (2) not knowing what it is and wondering what it is. I don't think I am the best wife. Some days my mind gets the best of me, and I am convinced that I am slowly dying. I am the first to say yes to a glass or two of wine because it takes the edge off if even just for a moment. I just don't like the person I have become. I have made a conscious effort to avoid doctors at all costs because of the cost and it's not how I want to spend my days when my kids are at school. I persued many invasive procedures a year ago, and they didn't find anything, so I have decided that I must be insane. I don't talk about the pain often since I don't go to doctors I don't really think I have the right to complain, so I am sure people forget, but I feel like it is five hundred times harder for me to do everything. I am constantly tired, but when people ask me how I am feeling, I just say fine. I mean, do you really want to be friends with someone who complains all the time? I would do just about anything to make the pain go away. I am so very tired. 1. I could have on a potato sack, but as long as it looks like a dress, Tyler will tell me I look beautiful. Maybe I should invest in some mumus! HA! 2. I cannot believe Jackson will be in first grade next year. That is so old! I feel old. 3. I am a sucker for infomercials. I bought the Kettle Worx, workout program because it is sold as 20 minutes 3 times a week! #1 HARDEST TWENTY MINUTES EVER #2 IN PAIN FOR A WEEK after doing it once #3 doesn't motivate me to want to do it at all. I also purchase Turbo Jam two years ago, I would recommend that over Kettle Worx, seriously it is so hard. 4. What would you eat as your last meal? I can't choose! Seriously, I cannot imagine choosing. 5. I am terrible at returning emails, but I get frustrated when people don't return mine. HYPOCRITE MUCH? 6. DYING FOR A DIET COKE! 7. Kind of think all the hype behind the Royal Wedding is ridiculous, but at the same time it might be jealousy because I will never be royalty. 8. I would like to go on The Biggest Loser. I feel like I have zero motivation to get up and do anything, but with Bob or Jillian screaming in my face, it would be just the motivation I need. 9. Someone come hang some clothes up for me, PLEASE? 10. Did someone say Diet Coke???????????? BONUS-Joe's Diner on 16th Street between Camelback and Indian School is AMAZING. Cutest little place, food is DELICIOUS and INCREDIBLY CHEAP! Hurry there today! I am JEALOUS of these people I am related to. Jealous because they have the ability to fall asleep with a live band playing right outside our window. OK, so right outside is a little dramatic, but let me explain. 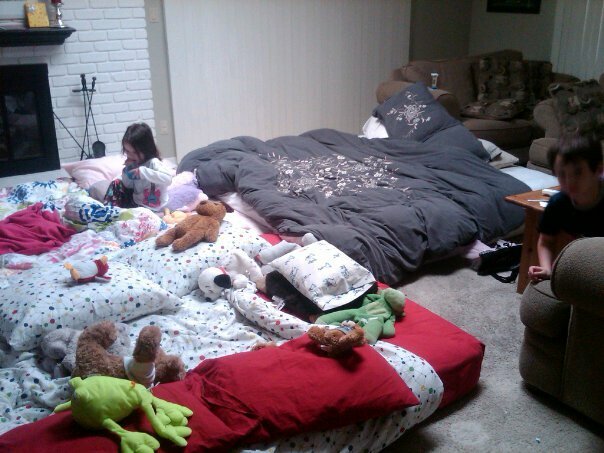 Last night we had a family slumber party in our family room. We pulled out all the mattresses and set up camp. As Jaclyn pointed out on Saturday, it's as close to camping as I get. It was fun, I think we started a little too early in the afternoon, and we were all a little aggravated with one another by about five. We all "went to sleep" around eight, it was a little warm with all four of us in one room, so we opened the back door, and a wonderful breeze was coming through the room. It was FANTASTIC, until the live band started playing at the Country Club, maybe 100 yds away. I am not kidding that we were singing along with the music, and all of a sudden the other three people in the room, OUT LIKE LIGHTS, snoring and all. I am like, "What the heck, there's a BAND playing people?" I stayed in bed for about an hour listening to it, until I heard the band leader say that they were going to take a little break and be right back. I was not sticking around to listen to them cover Journey as they announced they would be doing. I went in our bedroom and sat down on the futon, watched some tv, and eventually ended up falling asleep there. FAR FROM THE LIVE BAND. We woke up this morning and had doughnuts, and the kids had a blast, but Pat told me I need to contact the Country Club next time I suggest a family sleepover. I am INCREDIBLY, INCREDIBLY jealous of people who can sleep through noise. As anyone who has been "lucky" enough to live with me knows, I need complete silence to fall asleep, the tiniest noise wakes me up, I rarely sleep through the whole night, and I cannot go to sleep until everyone who is supposed to be at home in bed is at home in bed. 1. I love going to watch Tyler play tball. Seriously, it puts a smile on my face every time, and I think about all the cute and funny things the kids do the entire day. 2. Our street is being repaved this week, apparently they do it every four years. Some streets don't get repaved every fourteen years, but this neighborhood is full of elderly, retired people that have nothing better to do, so we must remove our cars from our house by 7 Thursday morning, and they can't come back until 7 Saturday morning. If you see above, the elderly, retired people probably don't have to leave their homes, so it is not a big deal. I will have to lug my sh** and my kids to and from the house to the Country Club parking lot every time I want to go somewhere. UGH! Frustrated to the max. 3. Ate at Beckett's Table. AMAZING. I love short ribs. His were AMAZING. I can't wait to go back. They also have Bacon Cheddar Biscuits-need I say more. The dessert we had was Chocolate Covered Bacon, Graham Crackers, PEANUT BUTTER MOUSSE, homemade marshmallows, drizzled with caramel-YUM! 4. Also ate at Bobby Q's. I have wanted to go for awhile, but honestly, the location is a little sketchy for me, but we braved it Saturday, and it was delicious. They start you out with these corn bread cakes, and when you are leaving, they give you donuts. Everything in between was wonderful as well: pulled pork, mac and cheese, burger, fries, YUM! 5. After reading the previous two, I should really just be happy that I don't weigh 300 lbs instead of always being so down on myself for my current weight! HA! 6. Tyler had to make a favorite things bag for school, in it she included: a pink ponytail holder because pink is her favorite color, a picture of fruit because that's her favorite food, a picture of Ellie the elephant because she doesn't go anywhere without her, a Hannah Montana necklace, and a picture of James. Jackson says, "Why didn't she put a picture of me in there? I should be one of her favorite things!" My response, "Daddy and I didn't make the cut either dude!" 7. I have been obsessed with House Hunters lately, and seriously I SCREAM at the television when they pick the wrong house. OMG, it frustrates me to the end of the world and back. I would not sacrifice living on a quiet street for a view, and you won't either when you have those kids you want in about two years! OMG! 8. I have only had one amazing massage in my life. It was at a chiropractic office, where I went for a consultation and what not, but I never went back for the recommended treatment, so I am afraid to call and make an appointment just for another massage, but it hurt oh so good. She was amazing. 9. We are going to Tucson in a month, and my mouth is already salivating when I think of Eegee's. 10. Pat LOVES LOVES LOVES his new job, and he is much happier, which in turn makes us all happier. Jodi Picoult Does It Again! Sing You Home, is another FABULOUS novel that addresses the issues at hand today. I don't like knowing anything about a book before I read it, I don't even read the book jacket before reading a book, so I am not going to discuss the book's plot. What I will say is that Picoult is the most forward thinking author of our time. There are references and mentions in the book of things that are happening NOW! I like that if my kids ever decide to read her books in the future they will know what was going on at this very moment. This book made me incredibly sad! Most of her books make me cry uncontrollably, this one made me ashamed of the human race. One day...one day, people will realize that their prejudice ways and judgmental behavior are not what the Bible is referring to. I don't know when, and I don't know how, but one day. I am certain that if I was alive during slavery or segregation, I wouldn't have been ok with that either. It probably would have been my "cause". I just wish that everyone could get along. Honestly, Pat's job depends on the fact that people won't, and our livelihood depends on the fact that people don't, BUT I would give it all up to live and let live! Since the term "goddess" is all the rage these days thanks to a certain Two and a Half Men star. I thought it was only appropriate to describe my daughter as a tball goddess. I don't think I have ever been prouder than Friday night when she took to tball like a miniature Olympian. She paid such close attention to the ball and where it was at all times. I am certain no one ever told her anything about ready position, and she was constantly at the ready. And, her mom has obviously watched A League of Their Own a few too many times because when she wanted to wear a skirt and knee socks, I didn't even blink an eye. She was confident and it showed. Here are a few pictures from her debut performance!